Baroness X Anthracite, an X Army group custom. 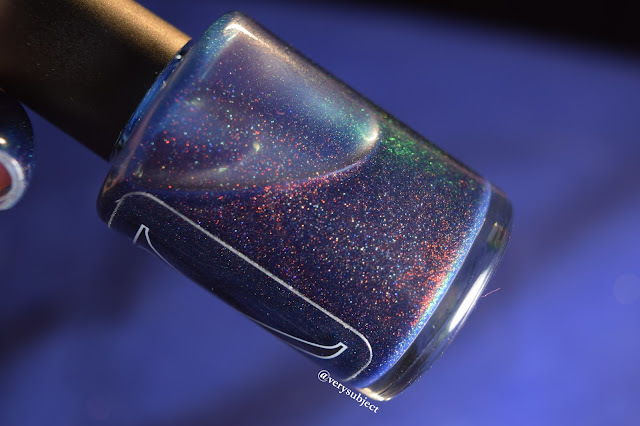 I like this polish a lot so I took a lot of pictures and I'm going to dump them on you with very little comment. It's a little sheer, so this is 4 coats and top coat, although I got away with 2 on my right hand. My left hand just has a harder time with VNL because of the overlay, especially on my cruel, prone-to-breakage index finger. 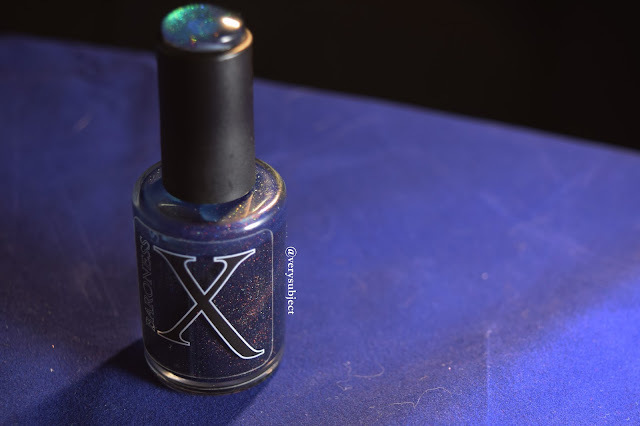 Anthracite is a navy jelly loaded with "unicorn pee" pigment as well as holo sparkle. In person, I'd say it kind of looks like Femme Fatale Lantern Waste without the flakies. Which is to say, it's basically one of my all-time favorite polishes. Most of my pictures come off as super blue, which is how it looks to me (as well as my camera, lol) under my artificial lighting setup, but since I wasn't getting my wisdom teeth pulled today (yesterday was long and would have been painful without the advent of anesthesia), I managed to get some pictures in daylight. Glorious, cloudy, "Seattle-is-back-to-normal" daylight, which brings out kind of the almost murky, slightly greenish tinge of the navy base. Oh, and final note in case the pictures didn't make this clear, this polish is the perfect blend of holo and unicorn pee. Perfect. Neither element detracts from the other I'm pretty sure this makes Demetria some sort of mad genius. Beautiful photos Celia, I can't eait to wear it! Sorry about your feet, I had mine done years ago and it was not fun. Thank you! I'm so obsessed with it, I don't even want to take it off at all. Luckily, as I've been telling everyone, it wasn't a huge deal. They didn't have to put me under at all or anything. Just can't really chew food right now, lol. what a gorgeous blue color, your swatches are amazing. If I was wearing this I wouldn't want to take it off either. Sorry to hear your getting your wisdom teeth out, ouch! It can't be fun. Best wishes for a speedy recovery. Thank you for both the compliments and well-wishes!